A good job then, that some beautiful treasures were purchased and stashed away at the bottom. Some things don't travel well and we are not generally souvenir hunters, preferring the practical, the edible and the photographic kind of product to bring home. Items found on markets are often cheap, imported goods from China and I am wary of buying things without sufficient knowledge to discern the genuine from the fake. After all, a girl can't have too many bags, can she? (Dont answer that, Mark) The combination of indigo and scarlet is a classic, isn't it? The geometric batik patterns are intricate and seem to be individual to the piece - I don't know if each woman had her own, personal design or if a family or tribe used the pattern to identify themselves. All I know is that hours and hours of work must have gone into the creation of these wonderful fabrics and that I, for one, am a very appreciative owner. The scarlet cotton applique has been applied by hand with absolute geometric precision. Mitred corners are beautifully neat and there is little or no bulk. Traditionally the base fabric would have been hemp (as the Hmong woman in the workshop was using) but I am not sure that the fabric of my bags is coarse enough to be hemp. I don't know. In places, the lengths of fabric have been joined, creating interesting intersections between the patterns. And those batiked patterns underneath the applique continue to delight and amaze me with their precision. The hours of work spent on the batik and applique do not complete the process, however, for there is the cross stich section too. This is worked in a variety of fibres in the samples I have - some stranded cotton and some thin woolly thread, worked on an evenweave cloth with slightly less precision as the applique! Fuchsia pink, lemon yellow/lime green and white seem common to all, with hints of emerald green, teal blue or primary blue here and there. I understand the Hmong women work the cross stitch from the back of the cloth and having watched a couple stitching, have no idea how they can produce such elaborate embroidery with such apparent ease. I guess it's practice! They work four or five arms lengths of fabric for a skirt and may only make one or two in a year. The beauty of their skirt reveals their personality - if they are not full of beautiful batik and embroidery, the woman may be thought of as lazy! And on each of my bags (ooops, yes, I did buy - ahem - more than one) there is a large red rectangle in the cross stitch panel. On one of them, there's a couple more appliqued squares too, though I didn't see that elsewhere. 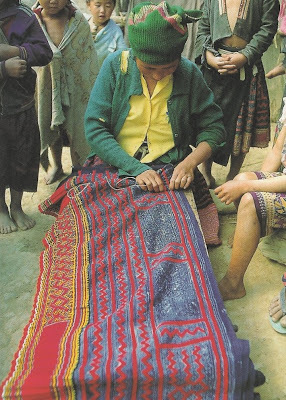 To put all of this into context, here's a photo I scanned from the Legends in the Weaving book, showing a Blue Hmong woman making the pleats in her fabric to create a skirt. Sadly, these skills are disappearing and we spoke of this with Ming, our guide. Young people want to wear the same blue jeans and T shirts as their counterparts worldwide - why not? For those who do want to keep links with their heritage, cotton cloth is purchased and synthetic dyes used rather than the traditional plant materials. Workshops such as Ock Pop Tok are doing a great job in educating visitors about the skills and traditions of the Lao people. I felt privileged indeed to learn from them and feel ambivalent about my bags: sad to think a woman has cut up her beautiful skirt to create a product to sell on a market stall but happy to own such a treasure and to share a few details about its background. Some wonderful photographs and more information about these people and their fascinating textile traditions can be found here.